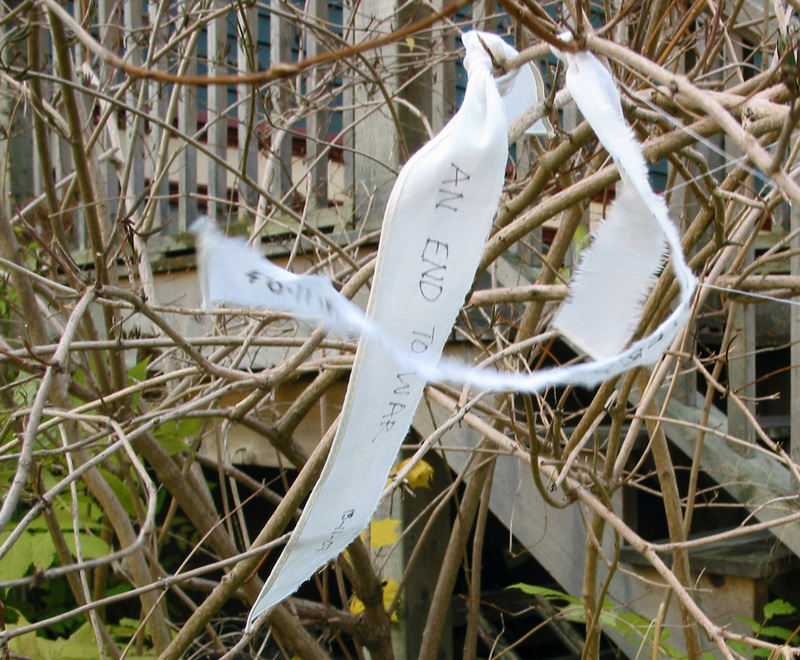 As part of her residency as the Inaugural Program Associate for RISD’s new Office of Public Engagement, Hall responded to the invitation to make new for a site-specific installation. 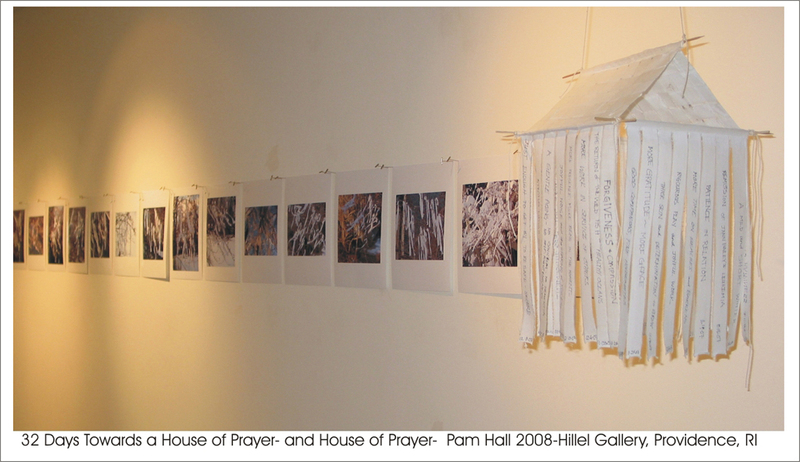 Revisiting the preoccupations of Path to the Wishing Place (1988), and a 2004 Marginalia “square”, Hall undertook a daily prayer practice called 32 days towards a house of prayer, which was completed just before the turning of the year. 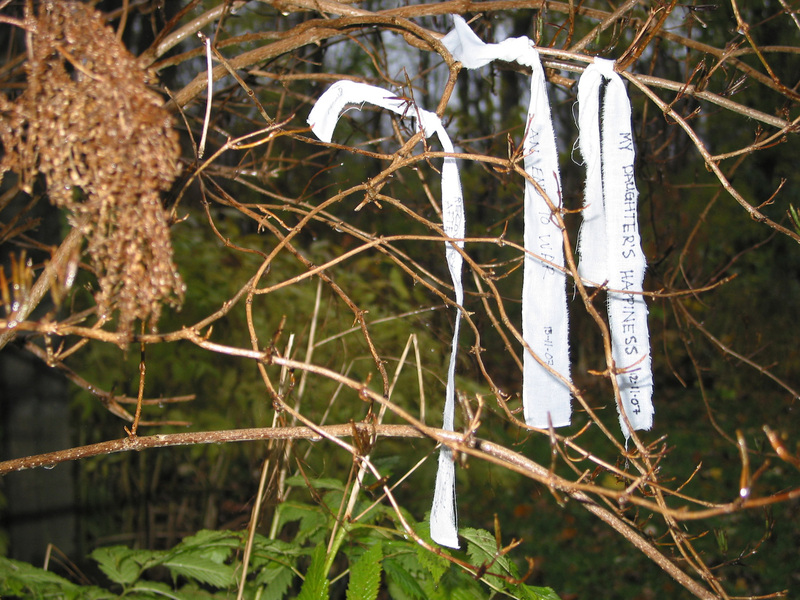 It forms one element within, and the foundation for her site-specific installation in Providence in January/February, 2008. 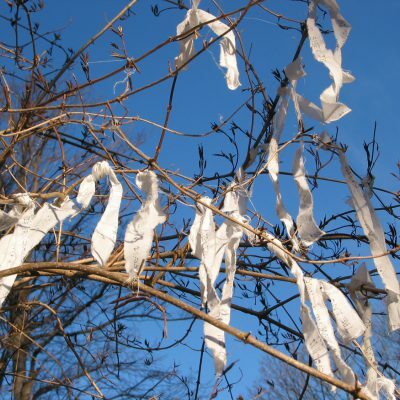 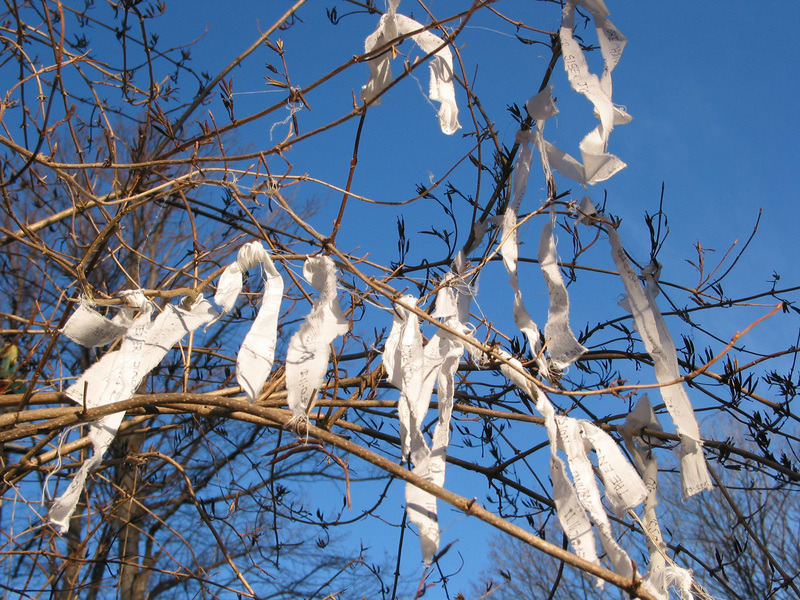 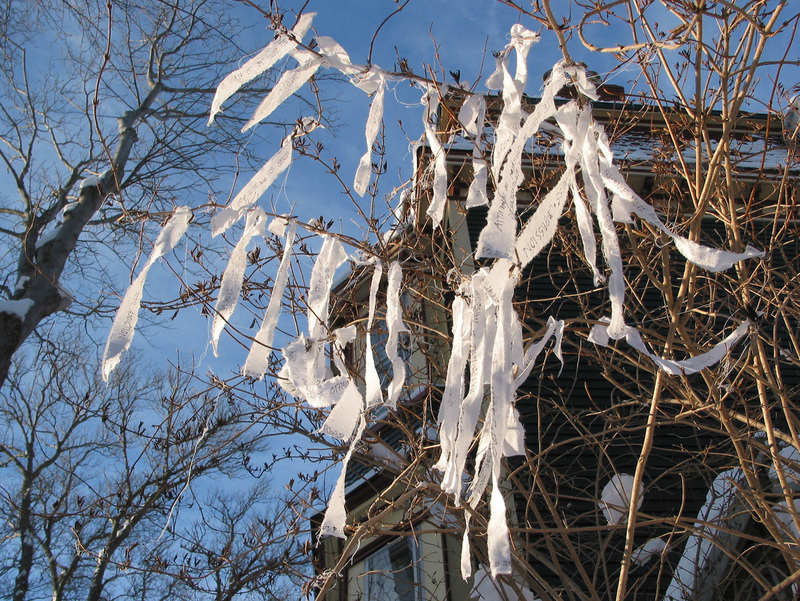 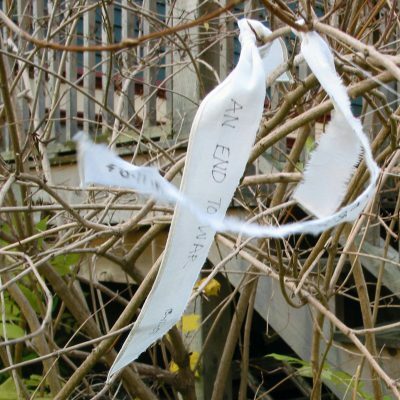 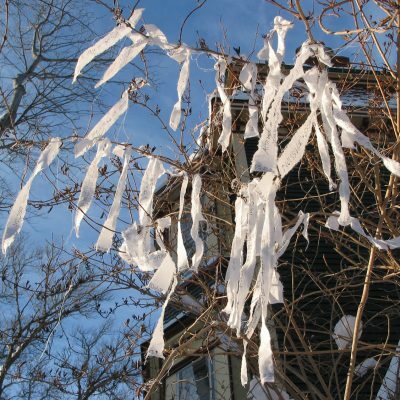 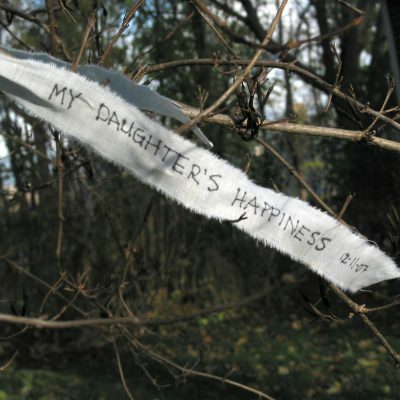 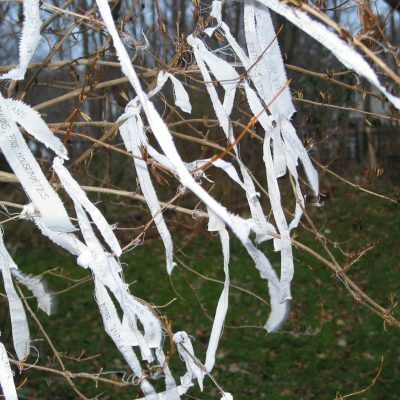 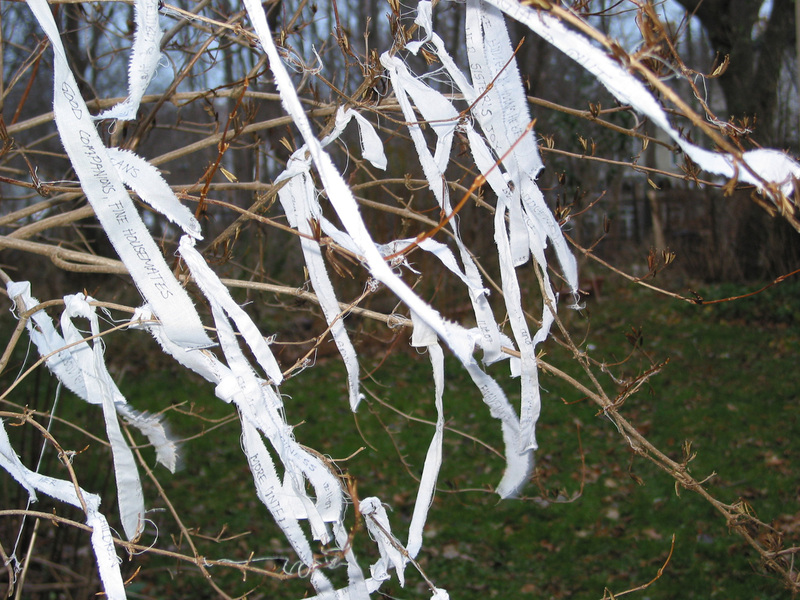 Each morning between November 12th and December 14th, 2007, Hall woke to greet the day with a wish/prayer inscribed on a small strip of linen which she then hung outdoors on a small tree near her house in St. John’s, Newfoundland. 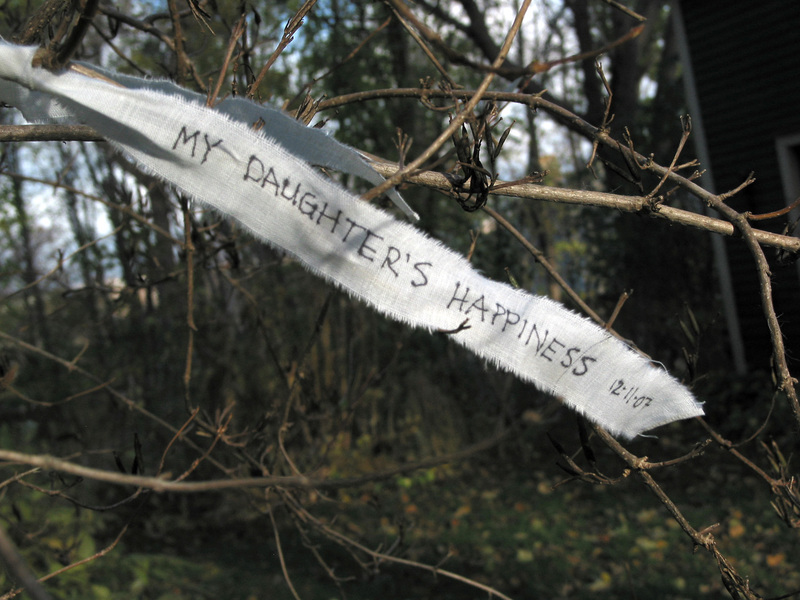 A daily practice intended to mark the change between fall and winter, it reminded her to begin each day mindfully and with full attention. 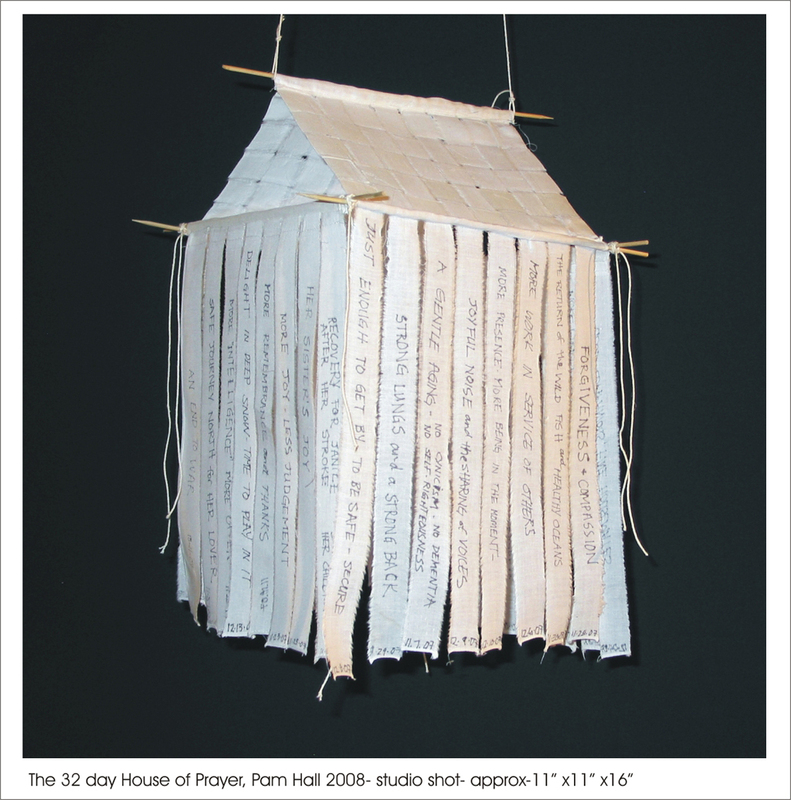 When the process was complete, she brought the rags indoors and made them into a small house… a humble but hopeful structure which may be the first of many to follow. 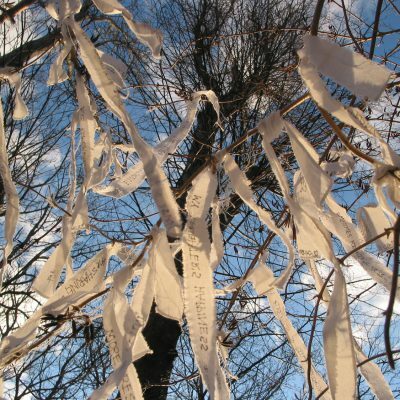 The other main component of the Hillel installation was a participatory Wishing Wall, constructed from over 200 “prayer rags” Hall had inscribed with wishes and prayers of her own, and of more than 50 other Canadians who answered her invitation for prayers to carry to Providence. 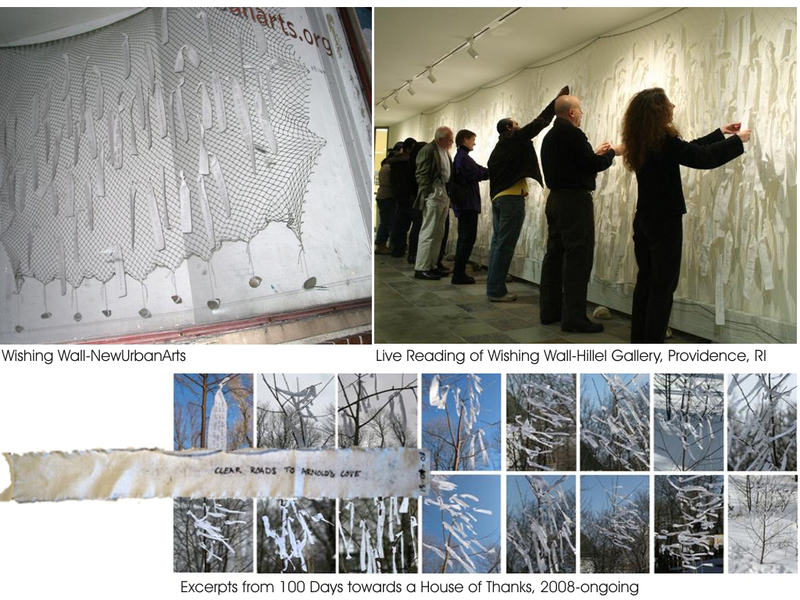 Members of the Providence community at two locations were invited to make and add their own “prayer rags” to the wall for the duration of its installation, and eventually, Hall intends to sew them together to make a Providence prayer blanket, or perhaps construct a large scale “house of prayer”. 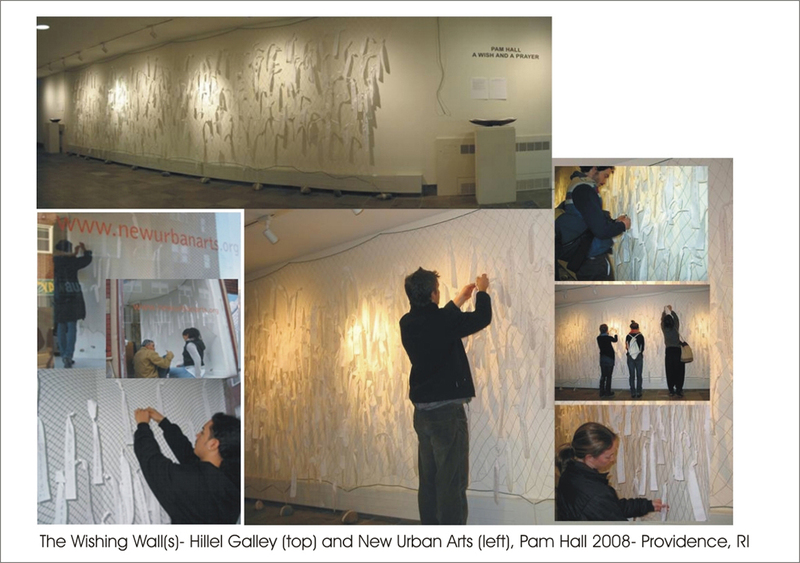 As an additional component of her residency in Providence, Hall created a second Wishing Wall, with the young artists of New Urban Arts. 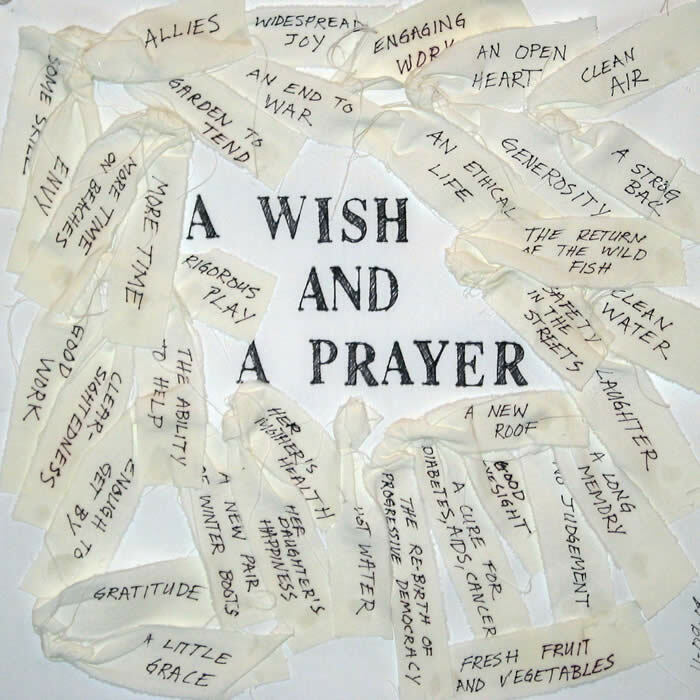 Smaller in scale, but in its way, more “public” – the NUA Wishing Wall grew in a street level window until, the day before the Hillel installation closed, Hall removed it, and transferred its prayers and wishes to the Hillel wall. 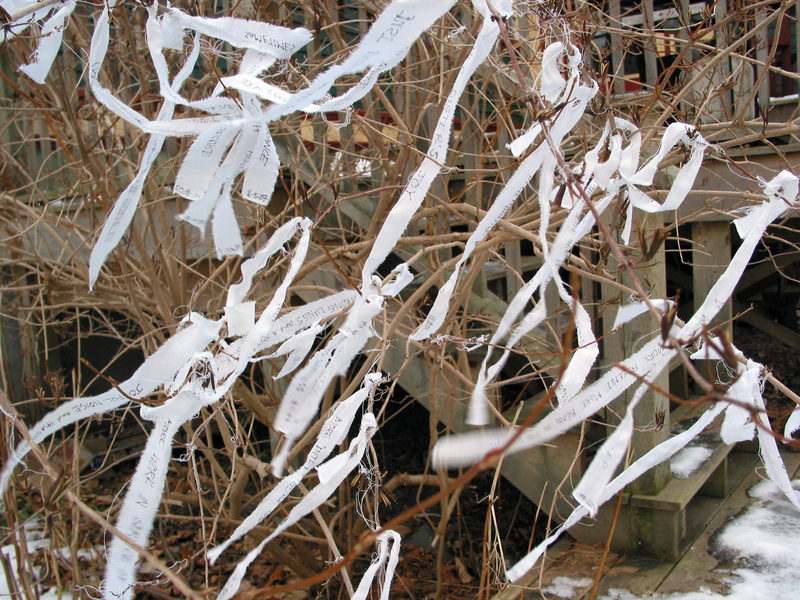 To close the installation at Hillel, Hall invited new friends from Providence to undertake a performative reading of the Wishing Wall. 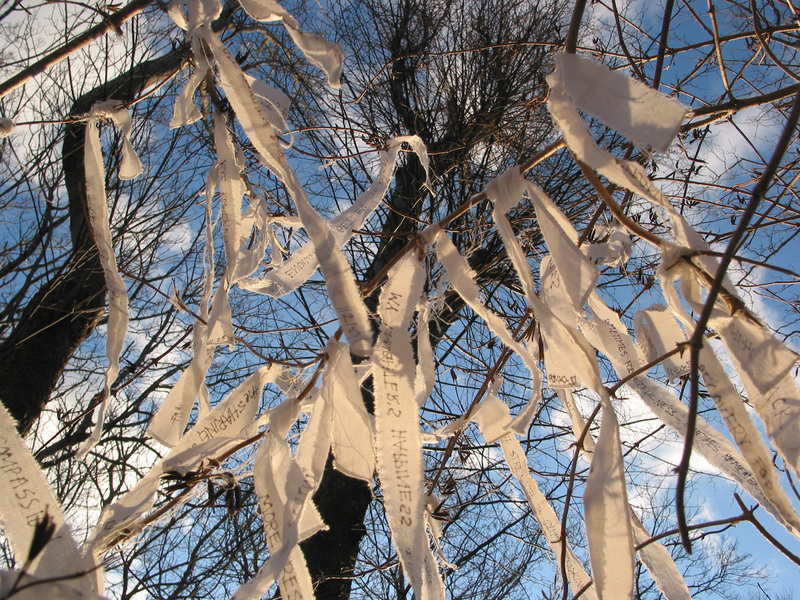 Bringing the wishes and prayers of others into “voice”, their overlapping murmer filled the space and provided audience members and the readers themselves with a moment of reflection, celebration, and presence to the yearnings gathered together on the Wishing Wall. 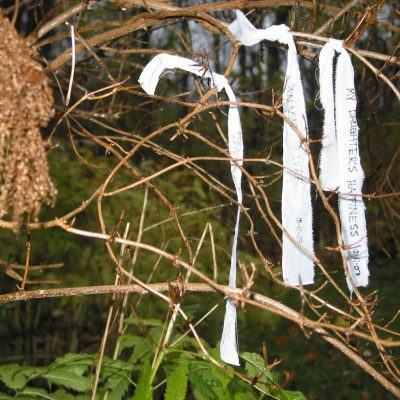 After taking down the installation- Hall left behind her own prayers for Providence – grateful for the help and support she had received from everyone who welcomed her there.